​Picture the scene … you’re out driving some off-road tracks, there’s just you and your co-driver, you’re miles away from civilization and you get a puncture – you don’t carry a spare because … pffft, who needs a spare? This is the time when you need one of the best tire repair kits! ​OK, so any serious off roader isn’t going to be driving in remote parts of the country without some sort of emergency plan … spare tire, repair kit or what have you. But what happens when you’re just out … visiting relatives, shopping … just normal day to day driving? ​Yes there’s a chance that there will be a tire repair shop that’s open, and close to you, but it’s still a proper pain and then of course, it could get expensive, they won’t guarantee the repair, they may not legally be able to repair it … you can see where I’m going. (Depending on where the puncture is located, and which state you’re in, the shop may not be allowed by law to repair, even though they could still effect a quality repair that would be almost guaranteed to seal). ​So realistically, what are your options? Even for those of you that wouldn’t know one end of a wrench from another, some of these repair kits are so simple to use, and quick … I have one of these kits (I’ll tell you which in one in the review) and I actually had to repair my tire just last week … from start to finish, including inflating took just 6 minutes. And it’s permanent. ​I guess for the main part, you need to decide whether you’re a complete ‘MacGyver’ that would be happy to strip the vehicle down to its component form, or someone that can barely fill the car with gas … that should indicate what type of kit you may want … extra valve cores and stems, valve core removal tool, valve extenders, brown plugs, black plugs … or just the bare minimum to fix a puncture and be on your way? ​I’d also make a note of caution: some kits (one of the kits listed here for example) use a chemical sealant, I have no issue with that​. I used something similar on my dirt bike, but for those of you with vehicles which use a Tire Pressure Monitoring Systems (TPMS) – the sealant could make a mess of the sensor, which could lead to having the tire removed anyway, and possibly a new sensor being fitted. ​For what it’s worth, I see the value of having a few extra spares … like valve cores for example, ​and kits that include spare valves are selling you something that you don’t really need – unless of course you happen to tow around a tire bead breaking machine and tire remover, because that’s the only way to fit a new valve. 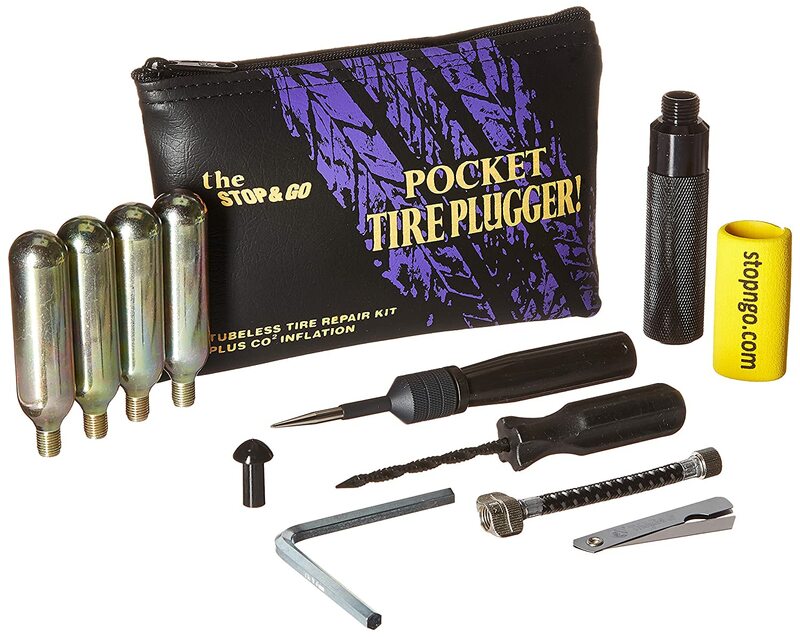 ​Everything you need to repair a tire, including the tire inflator comes with this 48-piece kit​. The only thing I’d be wary of is if you have a TPMS on your car, because it uses the brands Slime Tire Sealant with the patented Fibro-Seal technology which can seal holes up to 1/4". 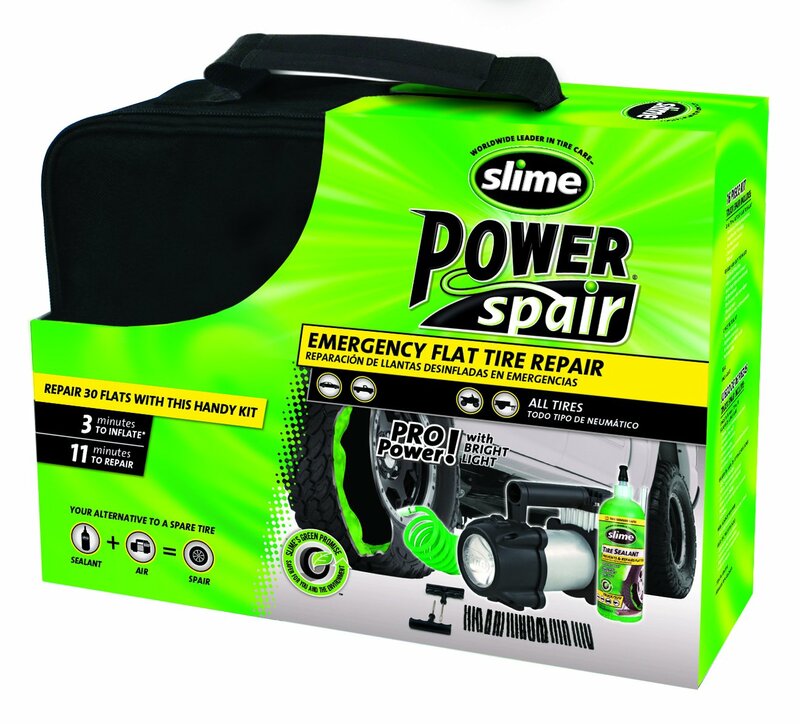 ​The premise is simple – remove the debris causing the puncture, remove the valve core, pump the Slime in to the tire and pump it up using the piston-driven inflator. No jacking, no other tools than what’s in the carry case and it’s all done in minutes. ​I love the sound of this kit, it’s so simple and easy to use, and you don’t need to be Mr Universe to remove the wheel, or even wrestle trying to punch a reamer through the hole. Simple & quick. ​What’s in the box: 4 x anodized valve caps, 4 x valve cores, air adapters, valve core removal tool, 24oz Slime Tire Sealant, T-handled reamer, T-handled plugging tool, pencil tire gauge, 30 x tire plugs and inflator with built-in light and pressure gauge. 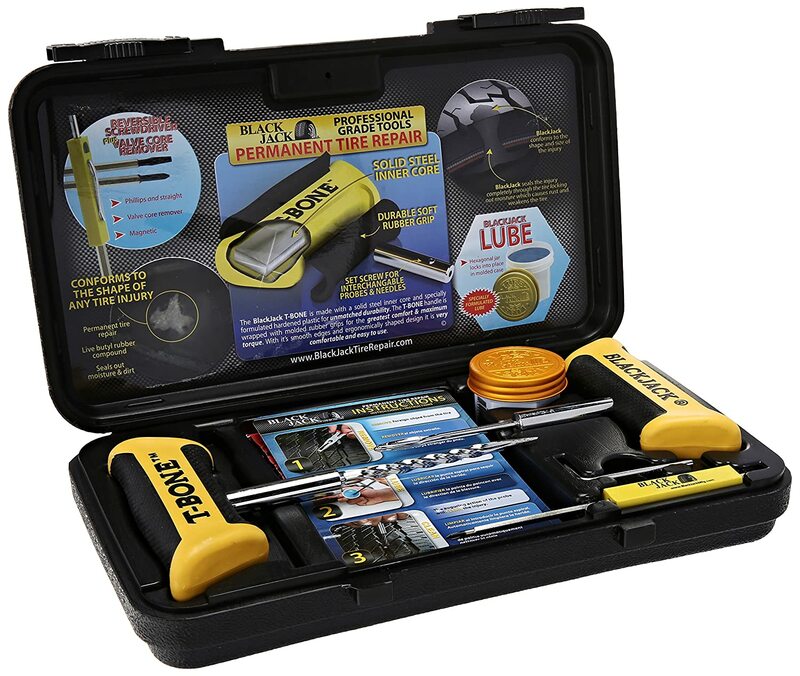 ​Basically, this heavy-duty​ tire repair kit has everything you’ll need, ever. ​It would be a great choice as an emergency kit, or even as a gift for a loved one … you literally don’t need to include anything else. 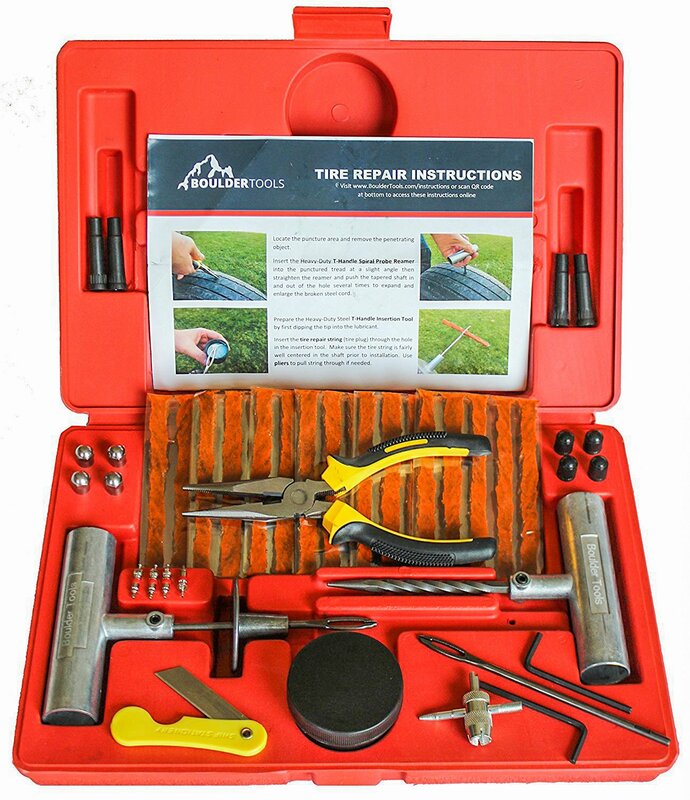 ​Boulder Tools say that this kit will repair any tubeless ​tires on pretty much anything – truck, motorcycle, car, Jeep, RV, tractor, trailer … ​from mud tires to ultra low profile tires. 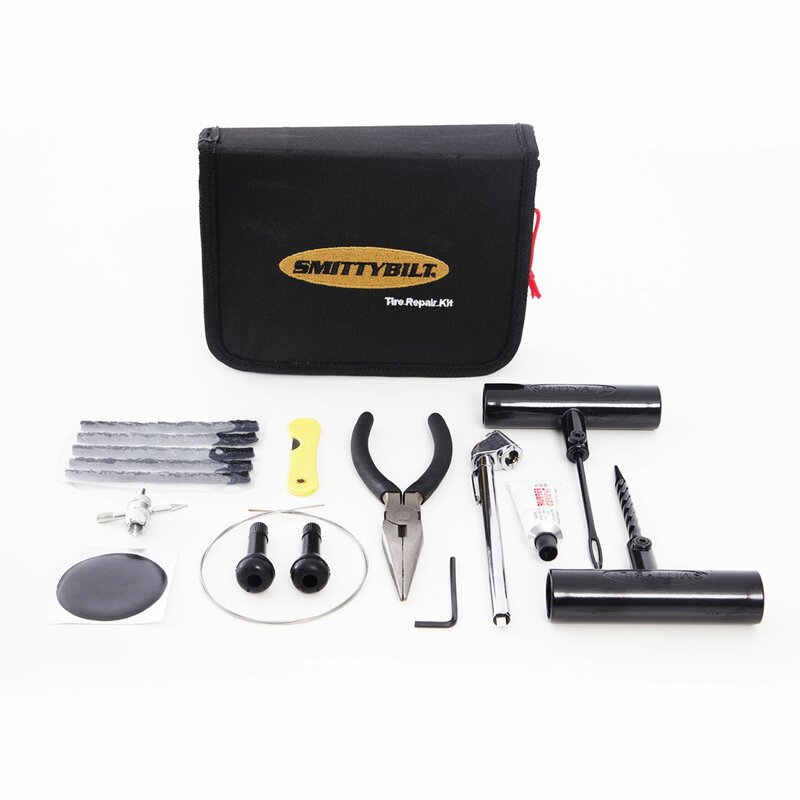 ​It’s a 56-piece kit and includes everything bar the inflator which you’ll need to purchase separately, and it’s been engineered to give a lifetime of service … this isn’t a cheaply made kit, despite the extremely competitive price. It also uses brown strings (rather than black) which offer superior sealing and longer life, both in terms of shelf life and active life. ​What’s in the box: 1 x Heavy Duty T-handle insertion tool, 1 x Heavy Duty T-handle spiral probe, 1 x insert tool needle replacement, 2 x hex keys, 30 x brown repair cords, 1 x needle nose pliers, 1 x knife, 1 x jar of lubricant, 1 x 4in1 valve core tool, 4 x plastic tire valve caps, 4 x plastic tire valve extenders, 4 x chrome metal tire valve caps, 4 x valve cores, 2 x replacement T-handle set screws, 1 x storage case, 1 x small accessory storage case. ​Boulder have put some thought in to this kit, the tools are high quality, and it wouldn’t be out of place in a pro tire shop. Sure there’s some stuff in the box that is … not particularly useful, but you can discount that, perhaps even remove it from the kit and forget about it. One thing’s for sure – everything in the box is of decent quality and I’m surprised that it’s as well-priced as it is. ​Safety Seal say that it’s a professional quality kit … I don’t know whether that holds up or not, but the overall feel of the kit is of good quality, just not perhaps ‘the ultimate’. The repair is designed to be permanent, not a temporary get-you-home measure, and it includes 30 strings – should last for many years. ​You’ll need a separate tire inflator, ​otherwise everything you need (minus some quality needle nose pliers) is in the box. ​What’s in the box: 30 x strings, 1 x metal insertion tool, 1 x spare insertion needle, 1 x metal T-handle spiral probe, 1 x lubricant, 2 x razor blades, 1 x carry case. ​Not quite the cheapest kit in the list (I’ve left that til last), but it’s the second cheapest here, and some purchasers have commented that it could be down to the quality of the tools – the insertion tool in particular seems to bend if you’re not careful. ​With that said, everything works as it should do, and it’s a comprehensive kit that includes nearly everything you need minus the inflator. For me, I’d view it as an emergency kit to get you home – throw it in the trunk and use it once or twice and it has paid for itself. Strangely, it includes ‘side wall bailing wire’ which I’m not sure what it could be used for … it says to repair the side wall, but I genuinely don’t know how that would work. ​What’s in the box: 30 x self-vulcanizing plugs, 1 x lubricant, 1 x folding knife, 1 x needle nose pliers, 2 x valve stems, 1 x dual head tire pressure gauge, 1 x side wall bailing wire, 4 x interior patches, 1 x reamer tool, 1 x insertion tool, 1 x compact soft case. ​Great for emergency use, cheap enough to have ‘just in case’. 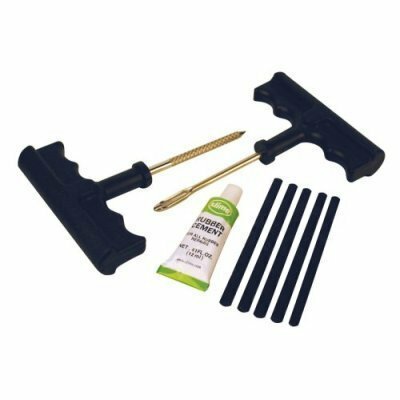 ​This looks to be a great kit, well made with decent quality tools – the T-handles for example are rubberized with a solid steel core – there’s no danger of these breaking. Despite that, there have been a number of reports that the handles come off the tools easily, and even when the locking screw is tightened up, there’s still an issue – they need to rethink the design in my opinion. ​The tools (insertion and reamer) are 4” in length, so they’re long enough for bigger tires, but if you’re looking for truck sizes, then a step up to the next kit brings about 6” tools. ​What’s in the box: 1 x reversible screwdriver (posidrive and flat), 1 x valve core tool, 1 x reamer with wide-grip T-handle, 1 x insertion tool with wide-grip T-handle, 1 x tub of lubricant, 20 x long repair plugs, 20 x short repair plugs, 1 x sturdy carry case. ​This is the very kit that I use (except mine’s bigger – 30 plugs instead of 15). I have used this kit dozens of times, and it has never once failed to seal a leaking tire. Stop & Go say that it’s designed for ATVs, motorcycles, golf carts and small tractors, but I’ve used mine for everything from SUVs to sportscars and motorcycles. ​It’s one of the most effective and easiest repairs for tubeless tires on the market right now, and start to finish can be done in minutes. The only thing that the kit is missing is a decent pair of needle nose pliers for pulling the tail of the plug back once it’s inserted (and you will need to do that). ​Being designed for smaller tires, it comes with 4 x CO2 cartridges to reinflate the tire and an adapter to connect to the valve; they work well on motorcycles and the like, but aren’t that great for car tires, so I’d still recommend another means of inflation if you rely on this kit to get your car home. ​What’s in the box: 15 x mushroom plugs, 1 x inflation nozzle, 4 x CO2 cartridges (16 gram), 1 x tire plugging device, 1 x probe tool, 1 x reamer / rasp, 1 x hex wrench, 1 x razor knife, 1 x extra zip lock bag, 1 x valve adapter, 1 x zippered pouch. ​I have one of these kits in each of my vehicles – it just sits there waiting until I need, and never lets me down. The real benefit of this kit is that it will conform to pretty much any shape, so whether the puncture is in the side wall, on the shoulder or in the main tread, it will seal it. ​Basic, but cheap. Very cheap. ​If you’re looking for fancy, keep looking – this is the simplest and most basic tire plug kit you can find, but that doesn’t take anything away from the fact that it still works just like the more expensive kits – strings, reamers … everything you need (aside from some form of inflator) is included. ​The difference here is that of course the tools are cheaper, and instead of self-vulcanizing rubber strings, you need to use the included cement to make it work – yeah, it’s more of a faff, but for ​under 10 bucks? Even if you have no idea how these kits work, or have no faith that you can do it, for this sort of money, it’s worth a try. ​What’s in the box: 1 x sturdy T-handled plugger, 1 x T-handled reamer, 1 x cement, 5 x plug strings. ​A number of these kits are slightly different, so it’s virtually impossible to give step-by-step instructions that will work for each kit​. They (the majority) work in roughly the same way – by forcing some type of plug in to the hole. ​Once you’ve located the offending bit of debris, you’ll need to remove that (usually with some pliers), and then open up the hole with a reamer / spiral probe / rasp (all pretty similar) which are typically included in a kit. ​Now it’s a question of inserting the plug, and that really does depend on the kit – some use a ‘string’ which is self-vulcanizing, some use rubber mushrooms and others use patches that need gluing. Here’s where it’s slightly difficult … the plug is generally bigger than the hole, so it does take some effort to get it through, but that’s how it needs to be, to create an air tight seal. ​Once the plug is inserted, you should re-inflate and trim the plug where necessary​. Either check for leaks with water or soapy solution, or use a pressure gauge to make sure you aren’t losing any air. ​Some automotive tire repairs are designed as a ‘get you home’ measure, some are permanent, but either way, you should always take great care if you’ve had a repair done – traveling at speed can be a way of loosening the repair which could lead to rapid deflation. ​This is where I have a confession – after plugging the rear tire of my motorcycle and having it in there for a few months, I’d completely forgotten about it. The motorcycle was used a little on the road, some track work and a bit of light drag racing, although the majority was road riding. ​Having forgotten all about the plug, I was on a circuit and pulling some insane speeds – north of 175mph when I suddenly remembered about the plug. That was me done for the day. I have to say that I rode that tire for a while longer, and it never missed a beat, never lost even 1psi, that’s why I’m happy using the particular kit that I do, and why I personally wouldn’t use another. ​To be clear: You should never ride or drive at that speed after a repair. ​In days gone by, repairing a tire was expensive and time consuming – more often than not, the tire would still need removing from the rim, and the method of repair wasn’t great … often involving a rubber plug type of thing, that was wrapped in some sort of string with a wire running through the middle of it to pull it tight. 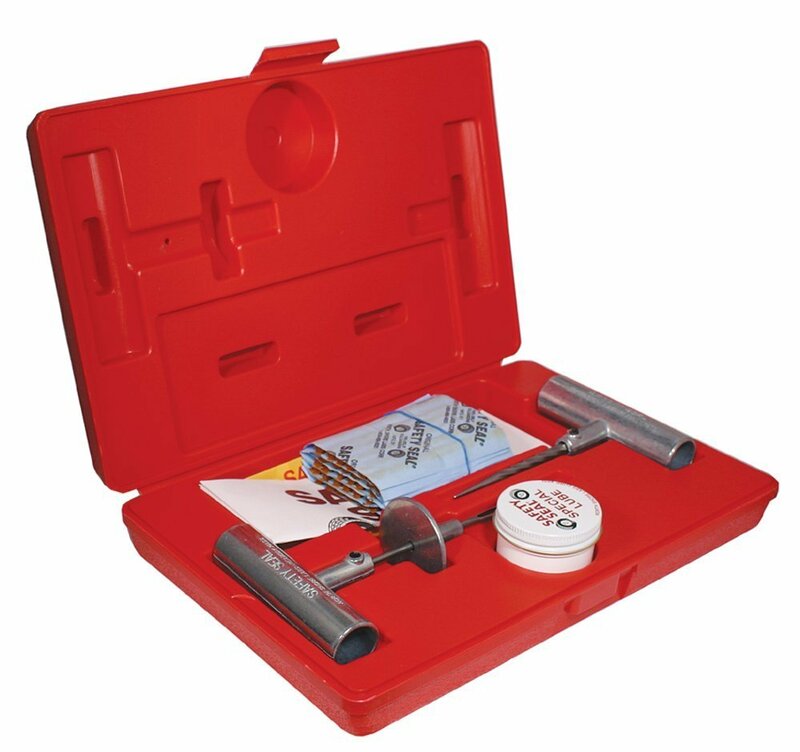 ​These kits allow for a professional repair at home or by the side of the road, without fuss and within minutes. Picking any of these kits will make things easier for you, they all have slightly different benefits, but the one thing they have in common is that they work, and can be done by anyone without any training or previous know-how.